The mere sight of a well-marbled otoro thrusts me into a visceral foodie frenzy. What prevents me from leaping over the counter for the unctuous tuna belly, besides manners and lack of coordination, is the cost factor. Especially when I consider that my sushi-loving wife could potentially uni us into debt. Fortunately, there are sushi counters in Honolulu with omakase courses that boast delicious neta (topping), shari (sushi rice) and prices that don’t break the bank. Here are my top picks, in order of price. Remember, the more you consume beyond what is included in the omakase course, the higher the price, so eater beware. All these recs are for omakase menus. A renowned fishmonger who gets first dibs at some of the finest seafood out of Japan, Morio crafts an incredible 12-15 course omakase featuring five or six nigiri. He offers basics like a sashimi moriawase (assortment) and includes a grilled dish such as hamachi kama (collar). 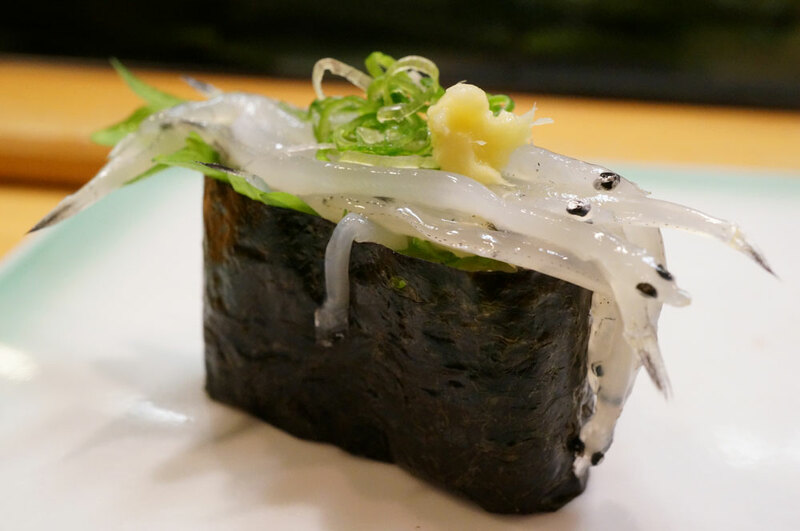 A fried course of flounder or moi precedes the sushi, which features more exquisite finds such as Japanese toro, shimaaji (striped horse mackerel), and a lobsterette, a crustacean that resembles an oversized amaebi. Ryuji Murayama is known for oversized slices of fish draped over vinegared pats of locally milled Tsuyahime rice from Yamagata. His nine-course omakase may include hamachi-zuke (marinated raw amberjack), maguro-zuke (marinated tuna) or a spicy tuna handroll; an assortment of tempura including shrimp, whitefish and/or snapper; an oyster shooter or salmon with ikura, and about six pieces of nigiri such as nodoguro (blackthroat sea perch), hirame (flatfish), geoduck and uni. If size matters, at least for the neta, then this place is for you. 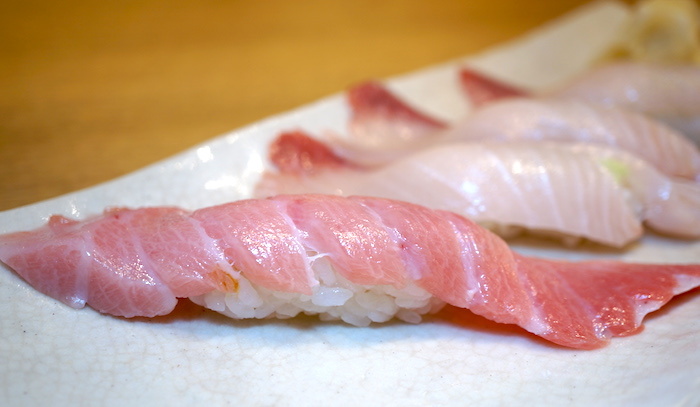 The nigiri Katsumidori Sushi is most famous for, chutoro. Although technically not a true omakase, the tasting menu at the hybrid kaiten sushi restaurant/sushi counter in the Hawaii Prince Hotel includes an appetizer, steamed dish, grilled dish, sashimi, tempura and four to six pieces of nigiri. Dishes such as cream cheese in seaweed, cured mackerel, misoyaki butterfish and sweet potato with ankake sauce could precede the voluptuous slices of maguro, chutoro and otoro for which the restaurant chain is well known. 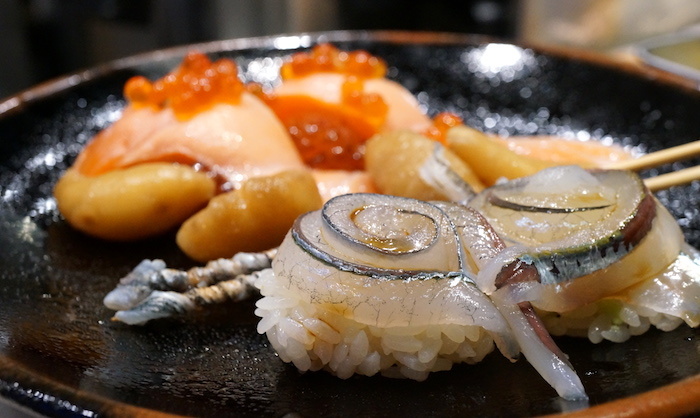 Not everything in the nigiri portion of the omakase is tuna: Well-portioned pieces of amaebi and tako atop rice pats seasoned with a proprietary blend of vinegars are included and go just as beautifully when dipped in the restaurant’s house soy sauce. The shirauo gunkan at Maguro-ya. Originally from the Kansai region of Japan, owner/chef Goro Obara brings over 40 years of sushi experience having worked the circuit in Osaka and Hiroshima before spending some time in Tokyo. 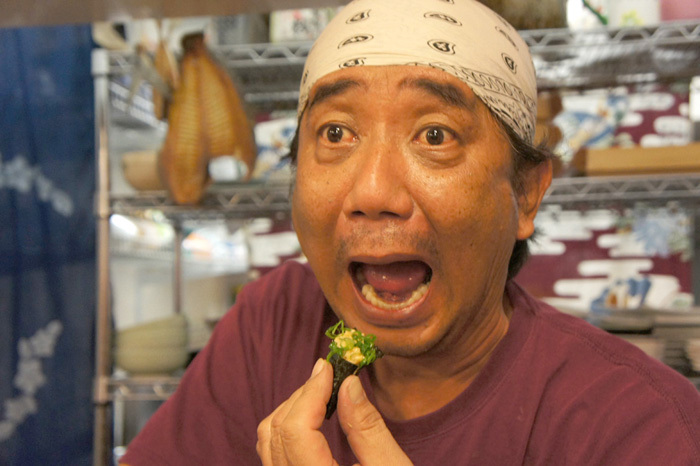 The 12-seat counter in his eponymous Japanese restaurant specializing in Hawaii’s longline catch is frequented by locals as well as Japanese transplants. Goro-san offers an omakase boasting about a dozen nigiri along the lines of hamachi, ikura, shiromi (white meat fish, such as tai or hirame), hikarimono (fish with silvery skin, such as saba or aji), seasonal local or Japanese catch (such as moi, hamo, or hotaru ika), and of course, maguro. If you do not mind “chopsticking” up a few more bucks, ask to try some kinmedai (splendid alfonsino or golden eye snapper), sayori (Japanese halfbeak), kue (grouper), or shirauo (icefish), which are not commonly found at many other sushi bars in town. 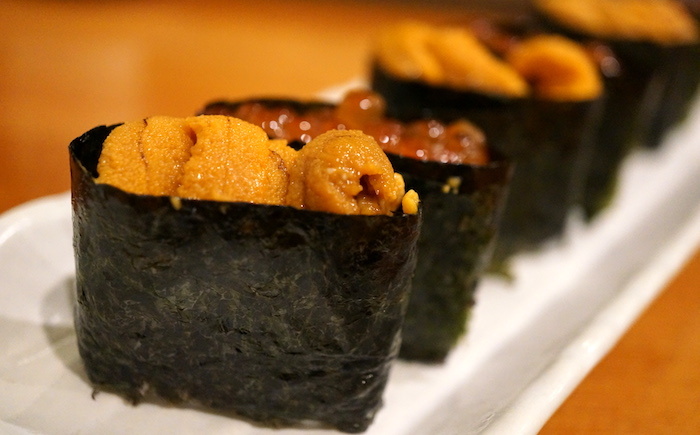 Uni and ikura gunkan at Natsunoya Tea House. The nearly century-old teahouse is home to a 16-seat sushi restaurant. Patrons enjoy a genuine sushi bar experience dining on 10-12 nigiri that, averaged out, comes out to $3-4 per piece. Chef “Sho San” worked in Japan at his family’s fish market and gained extensive experience in preparing the various components of fine sushi, including the blending of his own vinegars and shoyu. With the likes of maguro, hamachi, ikura, amaebi, King salmon and uni on the omakase, it is no wonder that the popularity of this hidden sushi bar is growing. To accommodate the crowds, the owners now dedicate a private room for groups up to 15 people and offer outdoor seating. What could make this place any more attractive? Its BYOB policy, of course.